Last week, there was an article in the NY Times about green bean casserole. Of course, this is a popular dish around holiday time, but it’s also a dish with which I’m very familiar given that I grew up in the land of can of soup casseroles. When I first moved to Texas many years ago, I was asked by a friend about my home state. As soon as I mentioned Illinois, she said ‘oh, that’s where every recipe has a can of soup in it.’ I almost fell over giggling because that was pretty accurate, at that time anyway. For the first Thanksgiving dinner that I prepared myself, I was determined to include a homemade green bean casserole sans cans of soup. I chopped mushrooms and sauteed them, made a bechamel sauce, cooked fresh green beans, and it all worked fine. That first time, I left the crunchy onion component out of the equation, but it was otherwise a fine made-from-scratch rendition. So, when I read this article about Joaquin Baca who created a homemade green bean casserole for his restaurant, I had to try his version. First, lots of mushrooms were sliced, and half of them were pureed with red onions to form a paste. The other half was sauteed in butter. Once browned, garlic, thyme, and then the mushroom onion paste were added to the sauteed mushrooms. Then, cream and stock were added, and that mixture was set aside. That part of the recipe could be made in advance and refrigerated until needed. Green beans were cooked in boiling water and then shocked in ice water. When drained, they were added to the mushroom mixture with sliced almonds and breadcrumbs. That was then transferred to a baking dish, and I took inspiration from the article for my pan choice. At the restaurant, Baca serves his individual casseroles in small cast iron skillets, so I baked mine in a larger cast iron skillet. It was topped with more breadcrumbs before being placed in the oven. While it baked, I fried some sliced shallots, rather than the suggested pearl onions, to sprinkle on right before serving. My shallots got a little too brown, but they were crispy and delicious just the same. We both liked this casserole a lot. It’s an inspired way to eat vegetables, that’s for certain. The crunchy sliced almonds are a nice addition that I didn’t include in my green bean casseroles in the past. However, the one thing that Kurt and I both noticed was that the breadcrumbs mixed into the casserole left it grainy when we would have preferred it smoother. The breadcrumbs on top were fine, but next time I would skip adding them to the mixture with the green beans. Other than that, this was an amazing, rich but fresh-tasting casserole that far surpassed anything with a can of soup in it. Delicious! The green bean casserole is definitely a "must have" for Thanksgiving, even though I do make it pretty often around my house even when it's not a holiday. I just made one last week, and yes it was with canned soup. I can't wait to try this "from scratch" recipe. I love the crispy shallots on top! I bet I would really impress my relatives from Illinois if I made this for them this Thanksgiving! What a beautiful version of green been casserole. I never saw one this pretty before! Have a fantastic weekend. Green beans are lovely and that casserole looks delicious! OMG. A REAL green bean casserole. I have to make it! It really looks as though it turned out perfectly. Will take your advice and not mix the breadcrumbs in the casserole. Love green beans. I'll be making something similar for my Thanksgiving menu. I love the last picture! Looks so nice...never had green bean casserole, sounds really great! No Durkee french fried onions? This is really interesting! I've always just sauteed beans and never thought to put them in a casserole. Greta tip about the breadcrumbs inside the mixture, I cna imagine it would make it almost feel like the beans are sandy or dirty being mixed in? My mom just brought over that recipe as a subtle hint for Thanksgiving. I've made the traditional one (canned onions and canned soup but with fresh green beans) for the past few Christmas dinners and everyone LOVES it. I'm not sure the extra effort is worth it, but this sure looks good. i love te ingredients in this casserole.. 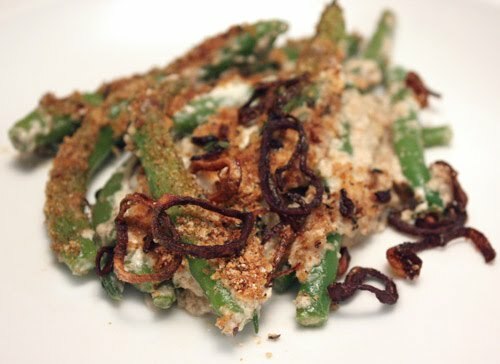 This is a terrific green bean casserole! Perfect holiday side dish! Almost like the Chinese green bean omelette that many homecooks do at home. I love making a homemae version too. I make onion rings to put on top. Love those crispy shallots. I look forward to trying your green bean casserole - it will take a while for me to think of it as not requiring a can of cream of mushroom soup. That's a good thing, I think! What a beautiful dish! I especially love the texture and flavor of sliced almonds... I can see why you would want to leave the breadcrumbs out of the mixture though. Thanks for sharing! Wow. This looks so creamy and delicious. I like the idea of pureeing the mushroom and add it to the sauce. Very interesting. I love the flavor of shallots and I think you might have improved upon the original recipe by using shallots instead of pearl onions. Classic dish for thanksgiving, although, I must admit never made it before. Not sure why? Seeing yours, maybe I should. Looks lovely. I'm going to try this with haricots verts + cepes when I get back to Paris. Admittedly, I'll eat any green bean casserole, but this is pretty much how I make mine. I know it sounds strange, but I also add a teaspoon of soy sauce and 1 can of sliced water chestnuts to mine, which is always nice for changing things up a bit. I can hardly wait to gorge myself on Thanksgiving! 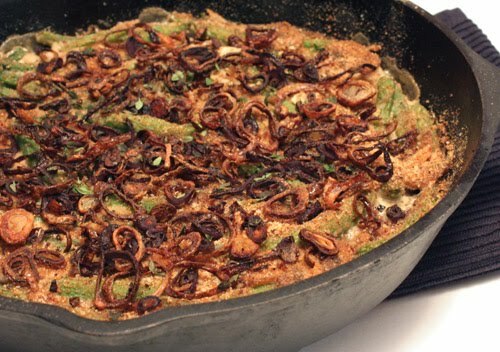 This is one of the best green bean casseroles I've seen! I love that it doesn't use canned soup. The almonds and shallots sound delicious in it. How good does this look! I can always use good new ways to use green beans as I find them a little bland on their own and this is perfect! I gave you an award over at my blog Lisa, so you can come and pick it up! would you please send this to my MIL? i'm sure i don't have to explain why. it looks delicious. Tasty! It looks perfect for Thanksgiving! This is one lovely green bean casserole!! Just georgous & ooh so good for you too! I also love the mushrooms in it! Yum! Being Chinese, I'm not all that familiar with the traditional Thanksgiving dishes. I know what they are but I haven't had much experience eating them. I've always been curious about the green bean casserole, but would much rather have a non-canned soup version. I was just wondering what to do with my huge bag of green beans. This looks great! This really does look amazing. I'm intrigued by puréeing raw mushrooms into a paste... didn't know that was even possible. Yum! That looks great. I was just pulling together my recipe for next week and I'm surprised at how similar it is. I'd never thought to do the pureed mushroom and onion paste, but I can definitely see how that would more closely, but more deliciously emulate the Campbell's soup version. However, I always get a few dried wild mushrooms and rehydrate them and use the resulting mushroomy liquid in place of the stock... but then I really like mushrooms! And the crispy fried shallots definitely sound like the way to go. 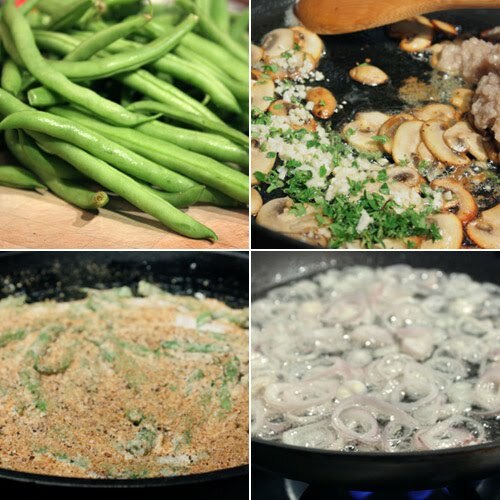 I'm also in the 'just sauté and serve' camp but your green bean casserole looks so tempting! Oooh, look at all those lovely fried shallots . . . !